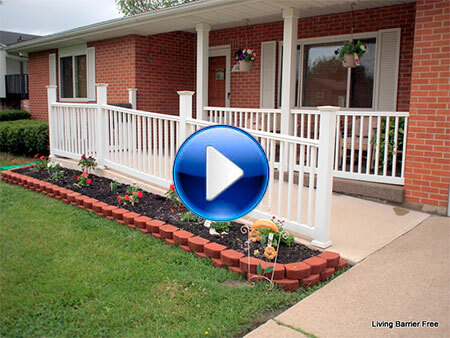 Living Barrier Free provides quality of life through home modifications. Mobility challenges can be greatly reduced by home modifications like wheelchair accessible ramps and wheelchair accessible bathrooms. This is why we are devoted to delivering environments that are ergonomically inviting to the human experience. Traditional designs do not take into consideration the number of barriers for those who are less than 100% mobile. Living Barrier Free will evaluate and make forward thinking recommendations that will be an effective return on your investment for many years to come. We identify quality information needed to design a construction plan. This plan sometimes consist of input from Occupational Therapists, Physical Therapists, Home Health Care professionals, and Durable Home Medical supplies to create your construction plan. We have been creating mobility solutions for our clients and we have developed an intuition of what works to add quality of life for them. This intuition is a combination of medical recommendations and sound construction methods that promote the aging in place lifestyle.